Over $3 million in improvements are being planned for the Sara Hardy Downtown Farmers Market – a redesign staff hope could take place within the next two years. Downtown Development Authority (DDA) board members reviewed new renderings and details for the project Friday. Since at least 2002, the DDA has discussed adding a covered structure at the market to shelter vendors and customers, as well as creating more of an “event space” vibe at the two city parking lots that house the market between Grandview Parkway, Union Street and Cass Street. New project plans presented by Traverse City-based Influence Design Forum (IDF) Friday call for the construction of a large covered “market shed” or pavilion stretching down the entire middle of Lot B, the eastern of the two lots (where the market is currently located). The structure would protect shoppers and vendors from the elements, while also providing wider aisles for easier navigability. Additional pop-up vendor tents could be accommodated outside the open-air building, allowing the market to grow from 80 vendor spaces to 107. On days the market is not in session, cars could park under the market shed. Other market plans call for redesigning the “bird house” building near the Boardman River to serve as a demo kitchen that could be used by vendors to display and cook seasonal produce, as well as serve as a “pop-up” restaurant featuring rotating chefs during the week for downtown diners. A permanent coffee vendor would be featured in the space, which could also potentially host new public restrooms. Outdoor chairs and seating would add a café-like vibe to the area, while an adjacent plaza would provide better views and access to the Boardman River. The design also calls for creating a “loading zone” on the western edge of the market area, allowing customers to pull up and load their purchases into their vehicles instead of having to haul apple barrels, large flower beds and other heavy products long distances. “That will help with the parking dynamic of the market, because you can buy what you want and then pick it up in your car without having to compete for (close) parking,” says DDA Marketing and Deputy Director Colleen Paveglio. A designated entry plaza with comfortable seating and public art is also suggested for the western end of the market, providing a meet-up spot for shoppers and a “sense of arrival” at the market, according to IDF. Bike valet service and racks, streetscaping improvements, and landscaping upgrades throughout the market area are also outlined in the plan. Lot T - the western parking lot - would essentially remain untouched and continue to be used for parking both during and outside of market times. The new renderings and design options come several years after the DDA first hired consultants in 2014 to create design options and cost estimates for the project. That process resulted in a proposed two-phase, $3.5 million plan in 2015. While the proposal earned the support of DDA board members and planning, parks and recreation, and city commissioners, Paveglio says staff also received feedback from those boards – along with vendors and the public – that more improvements and better renderings were needed. That prompted the DDA to work with IDF this year to update the proposal. DDA board members supported the new project plans Friday, though several highlighted elements – including potential public restrooms, stormwater runoff controls, and vegetation improvements along the river – they hoped to see better explored and fleshed out in the design development and construction phase of the project. Paveglio told the board that even though city officials have already approved the general concept of a market redesign, staff will bring the new plans back to those boards to ensure they’ve seen the latest version of the project. Paveglio said the only “sticking point” to fundraising will be demonstrating to grant foundations and other donors that the DDA has “skin in the game.” She said the DDA has already identified $400,000 in its TIF 97 fund for the project, and hopes to allocate up to $1 million total for market renovations. “To go to funders and not show that we have a stable amount to put forward to this project, it may look to them that it may not be feasible,” she said. 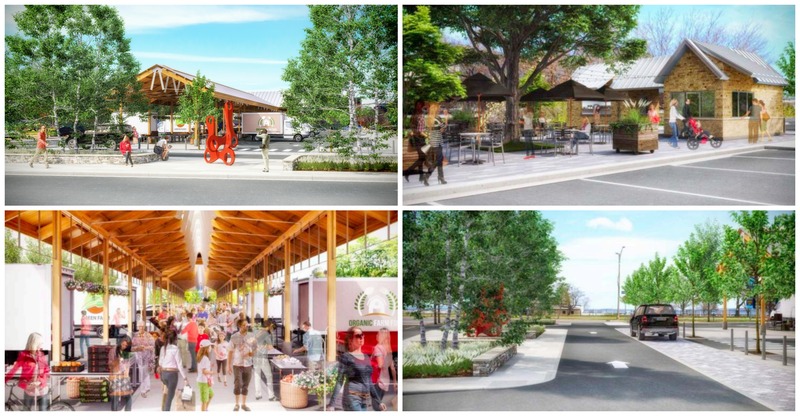 Pictured (clockwise from top left): Renderings of market shed entry plaza as viewed from the west/Lot T, redesigned "bird house"/cafe space near the Boardman River, drive-up loading zone for shoppers, interior of market shed. All renderings created by Influence Design Forum.